LONDON (REUTERS) - British lawmakers on Wednesday (March 13) rejected leaving the European Union without a deal in any scenario, paving the way for a vote to seek to delay Brexit until at least the end of June. After a day of high drama, lawmakers voted by 321 to 278 in favour of a motion that ruled out a potentially disorderly no-deal Brexit under any circumstances. 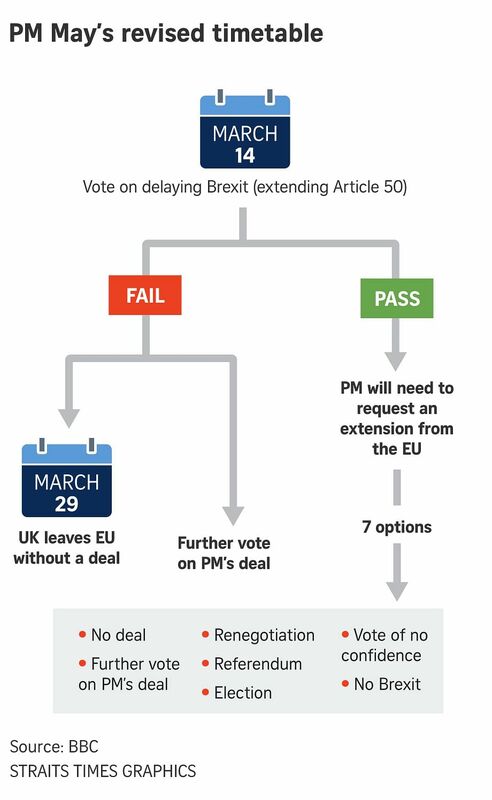 While the approved motion has no legal force and ultimately may not prevent a no-deal exit, it carries considerable political force, especially as it passed thanks to a substantial rebellion by members of May’s own Conservative Party and her Cabinet. May, who had insisted that it was not possible to completely rule out a no-deal Brexit, said lawmakers would need to agree a way forward before an extension could be obtained. The government said it would on Thursday propose seeking to delay Brexit until June 30 if parliament can – by March 20, the day before an EU summit – approve a deal to leave the European Union. The government did not say which day it planned to hold another vote. Commentators believe that with a no-deal Brexit voted down, May will now hope to persuade hardline pro-Brexit lawmakers to vote for her deal on the grounds that the alternatives offer a less clean break with the EU. If no deal is agreed by March 20, “then it is highly likely the European Council at its meeting the following day would require a clear purpose for any extension, not least to determine its length, and any extension beyond 30 June 2019 would require the United Kingdom to hold European Parliament elections in May 2019”, Thursday’s motion says. After Wednesday’s vote, the European Commission promptly restated its position that it was not enough for parliament to vote against leaving the European Union without a deal – it also needed to find a deal that lawmakers could accept. The pound rose more than 2 per cent on the rejection of no-deal and was headed for its biggest daily gain this year. The EU would prefer only a short extension, ending before EU-wide parliamentary elections due May 24-26, although it is not clear that this would be long enough to solve the impasse in London. The new European Parliament convenes on July 2. Britons voted by 52-48 per cent in 2016 to leave the bloc, a decision that has split the main political parties and exposed deep rifts in British society.